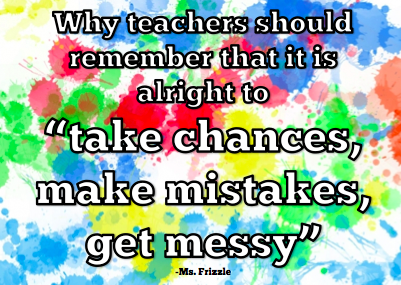 One of my favourite quotes is from the children's show Ms. Frizzle- "Take chances, make mistakes, get messy". Though it presents a good sentiment for children to know as they learn, that it is alright to make mistakes and that learning is not always linear process, I think it presents something that all educators and parents should keep in mind as well. - Are you as a teacher willing to take chances and try something new with your students? Are you willing to push past your comfort zone of the familiar in your teaching? - Do you recognize that it is alright to make mistakes? Teachers often feel that a mistake on their part means letting down students (something no teacher wants to feel), when in reality these mistakes can make room for new techniques and give you the opportunity to create something even better. - Do you judge yourself for your mistakes? Teachers are often very judgmental towards themselves, but what does this reflect for students? We tell them that their grades do not define them as individuals, yet teachers often feel that their perceived successes and failures in the classroom define them. - Do you resist mess? Yes, it can be exhausting to pursue a messy activity or project with your students. At the end of the day you can mop up the paint, brush the glitter from your hair, and wonder if it was worth it. Always remember that it likely was. Through those 'messy' interactive projects students can often learn so much more than they could through a typical lesson. There is no right or wrong in teaching. Some days it simply won't make sense to break out the construction paper or try a whole new style of lesson. But if teachers are able to keep themselves open to the possibility of change, of mess, of making mistakes, if teachers are willing to evolve- so too will their students. There is always room for change and growth. Great advice! Messy projects are tiring but always fun and memorable.